Chris McDonald fires Whitley Bay in front against Jarrow Roofing. Whitley Bay’s recent improvement continued on South Tyneside when Ian Chandler picked up his first victory since returning as Bay manager. As had been the case four days earlier in the drawn game against Guisborough, the match against Jarrow Roofing was one of contrasting halves. The opening 45 minutes was a virtual non-event with all the action coming after the break. It was no surprise that Chandler started with the same 11 that played so well in the second half in midweek, but a significant attraction for the large following of Whitley fans was the appearance in the Roofing side of former Bay legend and FA Vase winning hero Paul Chow, who returned to his home town club 12 months ago. This was the first occasion he had faced Whitley since his move and he was warmly greeted by visiting fans, who numbered around 150 and made up the vast majority of Roofing’s biggest crowd of the season. There was very little action of note in the first half, and while the home side had the larger share of possession in the opening stages, they could not produce any telling shots on target. Chow and his new strike partner Michael Mackay struggled to break down the Bay defence with Michael Laws, Steve Gibson and Callum Anderson giving them little time on the ball. Kerry Hedley had a shot held by Dan Gladstone after 19 minutes, Mackay then drove the ball wide of goal while just before the half hour, a low shot from Adam Rundle flew narrowly wide. There was a blow for Roofing after 34 minutes when former Bay midfielder James Fairley picked up an injury and had to be replaced. Two minutes later, Whitley constructed their first real chance when Jake Fowler played the ball across the face of goal and after a scramble the ball was poked just wide. At half-time Whitley made two changes, Craig McFarlane, who had picked up a knock, was replaced by Adam Shanks while Paul Kane replaced Chris Youldon. Kane’s contribution lasted a mere seven minutes, when following a challenge midway inside the Roofing half, he was penalised and moments later was sent off. It was later confirmed that the red card was for foul and abusive language directed at referee Geoff Liddle. The dismissal left Whitley with just Shanks playing up front, and a seemingly difficult task with the ten men trying to hold on for a draw. Fortunately that was not the way it turned out as Chandler’s men came much more into the game and posed the greater threat. On 55 minutes, Shanks created havoc in the Roofing goalmouth after racing away down the left and crossing to the near post where the ball ricocheted around the six-yard box with Alex Kempster poking the ball just wide. At the other end, Chow’s shot from 15 yards was blocked and a second attempt through a crowded goalmouth was pushed away by Gladstone. Jarrow had a great chance to open then scoring after 69 minutes when Jamie Marshall was played clear on the right edge of the box but he scuffed his shot well wide of the far post. That was a crucial moment in the game as just two minutes later Whitley finally broke the deadlock with an excellent goal. Anderson’s throw-in, roughly level with the right edge of the Roofing penalty area, was played short by Shanks into the path of Chris McDonald who advanced a few paces before unleashing a superb 20-yard shot that flew into the top of the net beyond the despairing dive of keeper Dan Regan. The hosts tried to force their way back into the game and 11 minutes from time substitute Michael Coghlan’s free kick was pushed over the bar by Gladstone. Back came Whitley and they almost made the game safe when in the 82nd minute Kempster played the ball through to Shanks, whose rasping shot was well saved by Reagan at full stretch. Although just one goal ahead, Whitley seemed in control of proceedings as Roofing failed to trouble the well organised Bay rearguard, but in the fifth minute of added time, the result was put beyond doubt. Josh Day, who had replaced Aiden Haley for the final few minutes of the game, caught the hosts napping with a quickly taken free kick. He played the ball short to Kempster who broke forward but a last ditch tackle from Andrew White deflected his shot off target. However, Shanks was quick to react and nipped in ahead of Regan, rounded the keeper and slotted the ball into the empty net to the delight of the Bay fans whose celebrations made it seem more like a home game. Shanks has been through a lean spell but this was his 24th goal of the season and it may be just what he needed to regain his confidence. It rounded off an excellent second half and brought Whitley a vital three points as they battle to move clear of the lower reaches of the table. 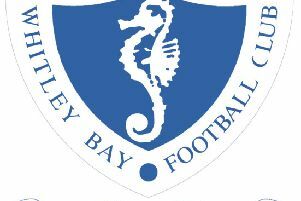 Whitley Bay: Gladstone, Munro, McDonald, Anderson, Laws, Gibson, Haley (Day 84), Fowler, McFarlane (Shanks 46), Youldon (Kane 46), Kempster.